1. Wash the cherries, remove the stalks and cut each in half, removing the stones. Tip into a mixing bowl with the sugar and lemon juice, stir well, cover and set aside for at least 1 hour to allow the sugar to dissolve and to draw the juice from the fruit. Stir well, cover and chill for 24 hours. 2. The next day, add the vinegar, stir well, cover and return to the fridge for 24 hours more – stirring again twice. 3. Pass through a sieve into a bowl and set aside for 2 hours to ensure that every last drop of juice drips through. Don’t be tempted to push the fruit through as you’ll end up with a cloudy pulp rather than clear syrup. Pass the resulting liquid through clean muslin before decanting into sterilised bottles. Store for up to a week in the fridge. 4. 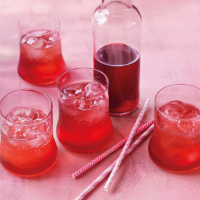 Serve as you would any cordial, pouring 40-50ml per person and topping up with water, soda or even sparkling wine. The leftover cherries can be served with ice cream or work particularly well in savoury dishes, such as a goats’ cheese salad or alongside barbecued lamb.